I love how walkable Geneva is. My friend and I covered a lot of territory walking around the lake, throughout the Old Town (and its many hills! ), and we even ventured the 30-40 minutes to Carouge on foot. So when evening came, we were looking for some easy nightlife that wouldn't require a lot of moving around. We were thrilled to find the best street in Geneva for dining and drinking - rue Henri-Blanvalet in Eaux-Vives. Les Eaux-Vives is in downtown Geneva on the left bank of the lake. It's a pretty easy walk from most places in Geneva. 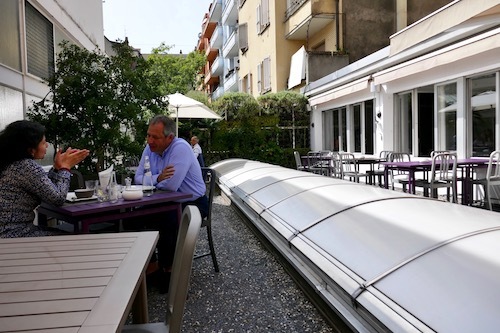 Run Henri-Blanvalet is a few blocks off the water and is home to several interesting bars and restaurants, making for an easy and fun night out in Geneva. Rue Henri-Blanvalet is a residential street, but Yvette de Marseille opened their pretty, secluded patio and restaurant in 2009, converting it from its former garage status. Now you can enjoy a spritz on the terrace while nibbling on Mediterranean tapas. The next arrival on Henri-Blanvalet was neighboring bar to Yvette de Marseille, L'Atelier Cocktail Club. You can find reasonably priced cocktails at this hotspot. Like many of the establishments on the street, they have a patio that takes up part of the street and adds to the outdoor fun when temperatures permit. If you're looking for a more substantial meal with your drinks, then head further down the street to Alma. Alma is serving Peruvian food with festive cocktails to match. There's a ceviche bar where you can get items like sea bream with lemon tiger lard, sweet potato, and corn. There's octopus carpaccio, chips and guacamole and Pisco Sours to wash it all down. If you want to step up your dining game even more, check out Grand Bottle. The Bottle Bros have two side by side spots on Henri-Blanvalet. Petit Bottle has snacks and drinks, while Grand Bottle has cocktails and a full gourmet tasting menu. We tried the tasting menu in the casual, but lively atmosphere inside Grand Bottle, and were not disappointed. The plating and components to each dish were truly impressive. There was thinly sliced beet wrapped in goat cheese, served with strips of sashimi, scattered on smooth, glossy rocks. Spiced crab sat amongst ribbons of seasonal zucchini. Citrus flavored apple gelee coins dotted plates of whipped foie gras. Duck paired with cherries and morrels. Each plate was better than the next. With outdoor terraces for each of these spots, the atmosphere on rue Henri-Blanvalet is quite festive with people spilling into the streets. It's perhaps not as enjoyable for those living in the neighborhood, but there's no shortage of good eating and drinking establishments on the street. If you're wandering the Eaux-Vives neighborhood during the day, be sure to stop into L'Adresse. It's just a few blocks from Henri-Blanvalet and offers a unique shopping and eating experience. There's a concept store with high-end clothes, shoes, and accessories. 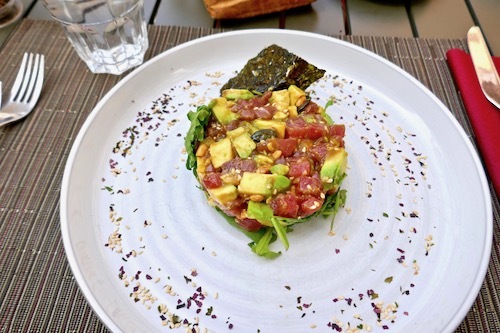 And who doesn't get hungry while shopping, so L'Adresse has an outdoor patio for dishes like tuna tartare and seaweed salad. I was thrilled to seaweed all over Europe. In my next post, I'll go into more detail on where you can find all sorts of healthy food including gluten free, vegan and organic options.